Any fan of the fantasy/sci fi genre should take note of this highly inventive debut novel, and any fiction reader should pay attention to Edison’s future output. While there are some basic problems with the novel, its numerous strengths outweigh them, most particularly the obvious talent Edison has for the writing craft. With greater experience and perhaps a bit less ambition than displayed in this novel, Edison could be a powerhouse. “The Waking Engine” probably falls closest within the category of ‘urban fantasy’, but it is truly a mix of multiple genres. This blending of disparate elements becomes the defining aspect of the work, from its influences, its structure, its writing, its plot, etc. Remarkably, most of these pieces end up working when put together. The strongest accomplishment (as appears universally acknowledged by both those that liked the book or not) is the world building. I am not convinced that the universe of “The Waking Engine” is wholly original in its ingredients – they are mined from a host of archetypic stories – but Edison certainly molds these into something his own. Decent fantasy world building is not particularly unique, but what Edison does excel at is the revelation of this world to the reader. The reveal is gradual, full of mystery, and thereby very captivating. It almost invites the reader to shout out questions as they try to gain footing in the uncertainty, bizarreness, and confusion. Tying the protagonists discoveries to the revelation for the reader helps make him relatable and helps drive the plot forward. For me the experience of reading “Waking Engine”, particularly the beginning, reminded me of playing the game “Planescape: Torment”, where the character you play in the game awakens from death in a strange world with no memory of how he got there or who he was. Though the protagonist in this novel does have memories, the experiences of waking to something unfathomable and strange is alike. You the reader/player discover this world as he ventures out into it. The second accomplishment of Edison in this novel is his prose. It is rich and poetic, utilizing a very precise vocabulary to render visualization to the strange environment of the city and its abnormal denizens. The language he uses is wonderful at rendering mood, and in this way certain parts of the novel have an almost gothic feel to them, particularly in those moments most dark. There is also a literary depth to the writing. Beyond starting each chapter with false quotes from famous (now deceased) people, “The Waking Engine” is full of references literary, historic, and philosophic. There is meat on the bones of this novel, and Edison gets his ideas across really well. Finally, Edison successful writes in the exposition necessary for revealing this strange world to the reader and protagonist. Information flows naturally and rarely feels forced. Despite these huge strengths there are some issues that arise from the sheer ambition of this novel. For one that characterization is not as developed as one might hope. Secondary characters are actually quite rich, inventive, and in several cases (particularly the villains) simply wondrous. This actually ends up making the protagonist feel rather hollow. An everyday Joe, yet seemingly unique in this universe, he never stands out as someone you are fully invested in, or really know. Little is brought up regarding his past, and the majority of the present is mainly about him trying to figure out what the hell is going on for him to worry beyond that question. If it weren’t for the link to him in the form of world building revelations, this would have been a major problem. The second problem comes from the sheer wildness of the plot and its plethora of characters. The pacing of the plot and the handling of its many threads becomes messy, and the extreme invention of the novel’s set up makes the ultimate climax pale strongly in comparison. In addition to the protagonist, other secondary characters begin to rise in prominence and import and thus in focus, which ends up compounding the lack of depth in the protagonist. 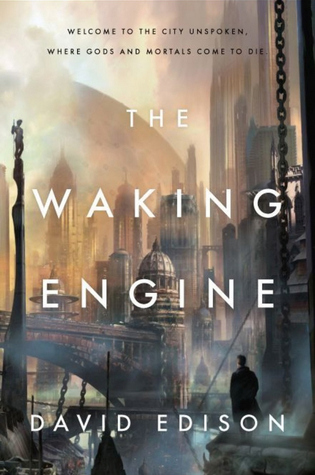 By the end of “The Waking Engine” I had the sense that I had gone through a crazy and thought-provoking ride with plenty of memorable moments, but felt underwhelmed by the actual story at its heart and relatively pedestrian ending. Being a debut novel with such high aspirations and a tone of confident freshness it isn’t surprising that some elements just fail to come together, and thankfully those don’t ruin the novel as a whole for me or negate the obvious talents that Edison has to develop.